Well we’re well into 2014 and that means the show season is starting the stir in the UK. Thanks to Andrew Greenwood for the tickets, our first show was over at Donington Park for the Classic & Modern Japanese & European Motorcycle Show. So it was an early and cold start to a Sunday morning for the 85 mile drive to the historic racetrack. I’ve been to the venue previously for the Restoration Show so in knew the venue and was looking forward to seeing, for me as I’ve not been to many bike shows, the variety of bikes. On entering the large hall it was clear if you were after parts to bring that bike out of winter hibernation, clothing, new helmet or a project (believe me there were some awesome looking project bikes at good money) you were in the right place. The hall was full of traders and autojumble stalls as well as a few outside in the rolling bike car park. Okay let’s get to the bikes; there was a show area with individual entrants that was the largest draw for the attending bikers. Bikes ranges from 50cc scooters right up to full street racers. Around the show were a few clubs, with UK2STROKES Stand literally lighting up the top corner with a fantastic display of twin strokers from big to very small. 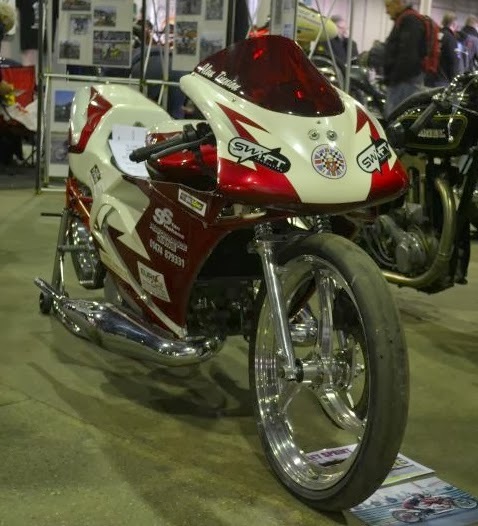 The National Sprint Association display though was just awesome with full out drag bikes, to stretched speed machines to classic bikes that bordered on café racers with their stripped down road legal set up. The Yamaha FS1 display was also staggering in both the number of bikes but also the quality. I also love seeing a restored bike stood next to one that ripe for a spot of treatment, it just shows the care and attention that’s been made to the restored bike and adds credit to the owner. Heading outside into the rolling bike show or bike parking area it was great to see so many people, despite the poor mornings weather, riding over which created more of a club meet feeling about that area with stories being shared and bits being pointed out. A great show with a good show of bikes, most of which seemed to be dailies or in regular use. However if you were after parts for your winter project or even wanting a summer project that this was the place for you. Highlight of the show, that has to be the Suzuki scooter below, only spotted in a corner on my second round, I just loved its honest look, the price and the fact just seeing it took you back to another time. This above blog is all about the different types of motor bikes.These bikes are looking too attractive with advanced technology.Thank you so much for this post.